You might remember the post I did last month on the Brilliant Update I did for Melissa Foster - Brilliant Life Design website. As promised here are the new business cards which turned out... well BRILLIANT! Here again we used a spot varnish on certain portions of the card. As good as this treatment looks, I don't recommend it for every design and logo. 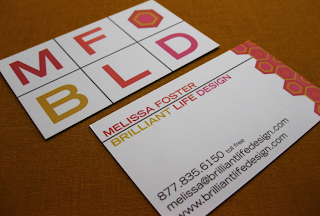 But I think it works great here, because of the simplicity of the card and overall design. It has a very slick almost scientific feel to it. Yesterday I had a ton of bananas that I need to use and fast. I scoured the internet to find a cake recipe, and nothing really grabbed me. 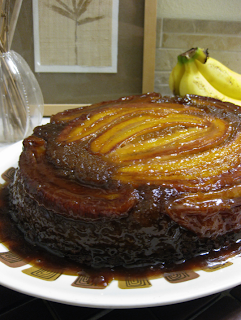 I thought back to the Mango Upside Down Cake I had made last summer and decided to try a banana version. WOW! So good...especially while it is still warm. Bananas atop sugary gooey mixture. When cake is removed from oven, you can see just how high it rises. This pan is 4" deep and the cake was about 1 1/2" from the top. fresh ground nutmeg - 4-5 few passes over a micro-plane should do it. 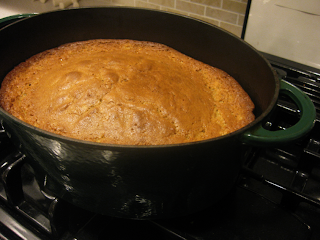 As this cake rises quite a bit, I used an oval cast iron dutch oven. Use a pan that is at least 2" deep. Place dutch oven on stove top and melt butter, brown sugar and rum over low heat. Once melted either slice bananas lengthwise and place flat side down in pan or cut diagonally in 1/4 ' slices and arrange in concentric circles on top of sugar mixture. Mix dry ingredients together. In a separate bowl, mix mashed bananas, milk and vanilla. Cream sugar and shortening with electric mixer until fluffy. Add eggs one at a time, mixing well after each. Add 1/2 off the dry ingredients and blend. Add 1/2 of the milk/banana mixture and blend. Repeat with remaining dry and liquid ingredients. 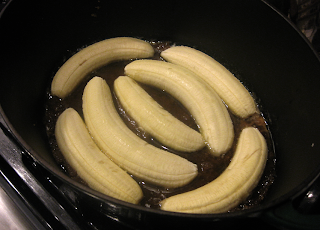 Pour over bananas in pan. Bake at 350 degrees for 1 hour or until sides pull away from pan and a pick inserted into center comes out clean. Remove from oven and let cool about 5 minutes. Turn out onto cake plate or platter. Serve warm. Store in covered container in the refrigerator. To enjoy the next day, pace desired amount in a covered baking dish and heat in 250 degree oven 15 - 20 minutes. 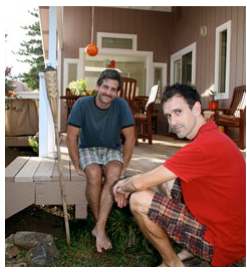 Today John and I just found out that our home is featured on the website [the nest]. Which is the sister magazine to the knot. 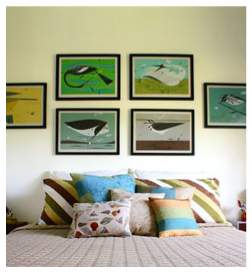 They had asked us for images several months ago and we had nearly forgotten about it until a reader sent me an e-mail inquiring about the Charley Harper Prints above the bed. Stop by and check it out. You will however have to sign up to the site to see the images... but it's a cool site with lots of design ideas. 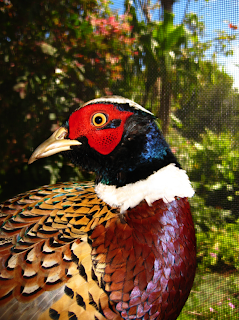 I wanted a catchy title for this post and decided to see what other word I could use besides nest... obviously I found nothing I liked, BUT, I did discover that a pheasant nest is called a nide. 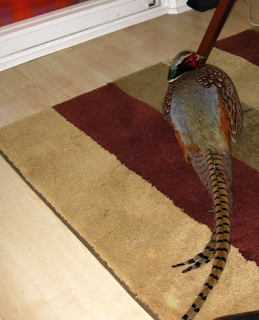 Fitting as we have our very our resident pheasant. 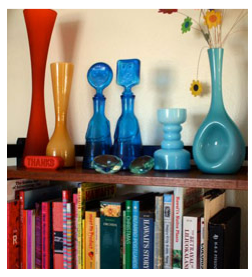 Mahalo to [the nest] for including us on their site. Here are a few pics from Kekoa's visit yesterday. As you can see, he took a little nap on his favorite rug. This photo in particular kills me because sometimes he sleeps on his side. HE'S TOO MUCH! He also likes to have a look out the window before heading back out, just to make sure "BIG DADDY" is not around. His father is always showing up here, trying to scare him off as he is very territorial. Usually if Big Daddy is around, Kekoa my stay away a day or two and BD has actually been right up at the house the last few days. Just like most families... there is always some drama. This is a post based solely on a status comment made on my facebook page. A good friend who knows me too well found a cartoon that parallels my doings in the garden and unbeknownst to him, also mine and Conn's daily dessert dilemma. I am Toad in the first episode (The Garden) muttering to my newly planted seeds. Who know seeds are afraid to grow. If so, my beets are real scaredy-cats! And I'm Frog in the second episode (The Cookie) complaining about too much of a good thing. I have considered sacrificing leftovers because of weak willpower. So if you find yourself home on this President's Day holiday and feel like revisiting your childhood for a few minutes, have a look at this endearing stop-motion animated short. 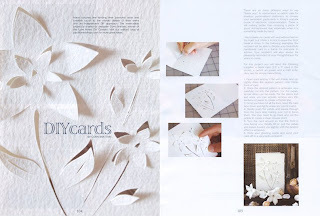 A few months ago I submitted several cards to PACIFIC WEDDINGS magazine for this DIY Keepsake Card feature and it is now out on the newsstands. Pacific Weddings magazine is published right here on Maui and is celebrating it's 10th anniversary with this issue. This is the design they chose to share with their readers. The idea was to create a thank you card that could be framed and kept as a keepsake. Therefore I did not put any writing on the front... which is usually the case when I make my cards. 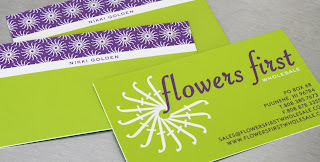 The design has a floral pattern sliced into it with a craft knife and the petals are then lifted and slightly curled creating a 3-D effect. Mahalo to Robyn and Shaunna for including me. It's a great honor to be in such a beautifully designed and produced publication. I will be posting a few of the other designs and how-to's that I submitted in a few days. Ok... so it's no secret that I have a sweet tooth and NEED, that's right... NEED dessert. Well here i was the other night without and egg in the house to make any baked up treat and nothing in the freezer. As I rummaged though the cabinets I found a box of KNOX unflavored gelatin that I had bought just to have around "in case of and emergency" like this. I looked around the kitchen and saw the liliko'i on the counter and that was it! Liliko'i & coconut wigglers! This is very similar to the Haupia Pie that I have made in the past. You need the following to make 36-48 wigglers. 1. Heat 1 cup water with 1/2 cup sugar. More may be needed if your juice is really tart. Less if not. 2. 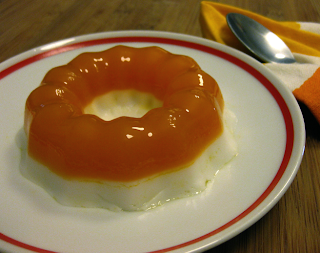 Dissolve 2 packs gelatin in 1 cup room temperature fruit juice. 3. 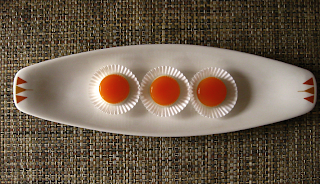 Pour hot water into juice and gelatin and stir a few minutes until dissolved. 4. 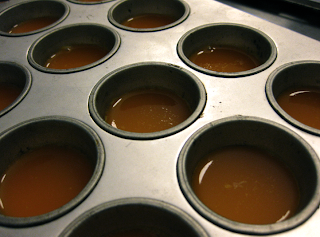 Put 2 teaspoons juice into 36-48 mini muffin pans. (I had a 12 muffin tray and a 24 muffin tray) if making 36 you will have extra juice. (see below on how to use that up). 5. Set in fridge for 1 hour or until firm. 6. Heat 1 cup coconut milk and 1/4 cup sugar in pan. 7. 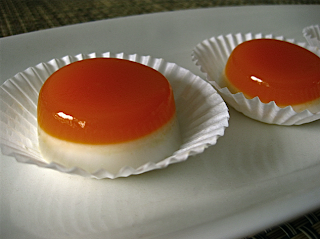 Dissolve 2 packs gelatin in 1 cup room temperature coconut milk. 8. 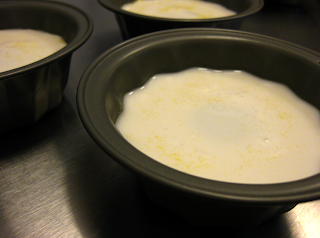 Pour hot coconut milk into room temp coconut milk and gelatin. Stir a few minutes until dissolved. 9. Remove fruit tin from fridge. 10. 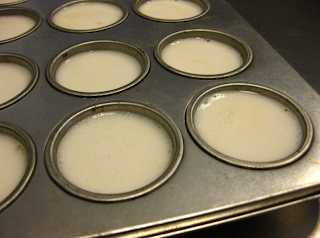 Put 2 teaspoons coconut milk into 36-48 mini muffin pans. To remove from tins, place 1 " hot water in the sink. Set tin pan into hot water for 2-3 seconds. You will need to use your hands to get them out so make sure they are clean... which they should be already. To remove from tins, place 1 " hot water in the sink. Set tin pan into hot water for 2-3 seconds. You will need to use your hands to get them out so make sure they are clean... which they should be already. If not loose enough, place back in hot water for another 2 secs. Not much more or the gelatin will turn to liquid. be patient with this step so that they come out perfect. 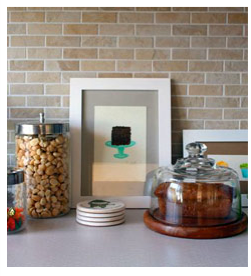 If you are not into this method, you can pour 2 layers into a brownie pan then slice into cubes. Store in a plastic container layered with wax paper. Place in individual white paper party cups for a party. Presentation is everything and it can be as simple as this. Since I made mine in the mini muffin tins, I had leftover gelatin. I simply poured it into 3 mini bundt pans which turned out really cute as well. I think this is a much better summer treat since they are cool and refreshing. Something warmer this time of ear is better, but in a pinch they were just fine. I thought I'd share this cool app I discovered on LinkedIn. It's called Slideshare, you can upload pdfs and it instantly transforms them into a slideshow that you can then add to your profile or embed in a blog (like so). I also think it's a handy way for visual artists to feature their work or editorial folks to upload stories or fashion pages from magazines that they have worked for. You can create as many slideshows as you like, and you don't have to be "LinkedIn." To sign up, go to slideshare.net. The "full screen" feature is especially powerful. Just click the little easel on the lower right. 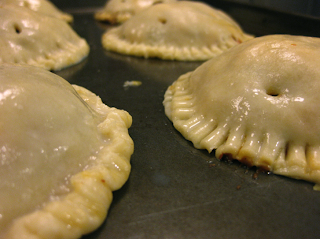 I have been wanting to make these tatsy empanadas for awhile now, but there was one thing holding me back. The frozen Goya dough that I have always used was impossible to find here on Maui. Finally it occurred to me... MAKE IT YOURSELF! So that I did. This is the recipe for the EMAPANADA DOUGH. This made 20 4" empanadas or 40 half circle empanadas. There was a lot of filling left over which I froze for a later date. If you want 40 4" with tops and bottoms as I made, then double the dough recipe and keep filling as is. 1 medium potato diced in small cubes. I used a purple sweet potato. 1 cup shredded cheese of your choice. Make your dough as described in the recipe. I rolled it out and cut it into 4" circles with a round cookie cutter. While dough is chilling, Heat the oil. Saute the turkey, onion and garlic until translucent. 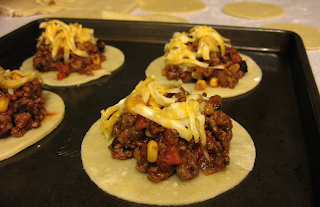 add all other ingredients and heat until veggies are tender. This should be rather thick and not soupy. Normally empanadas are folded over and made into half circles, but I made mine a bit different. I placed one round of dough on a cookie sheet, topped it with 1 heaping tablespoon filling in center of dough and 1 teaspoon or so of shredded cheese. 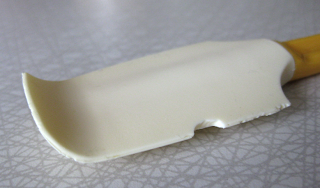 Brush edges with egg/milk mixture. Next place another piece of dough on top and seal edges with a fork. Pierce a few holes in top with a skewer or toothpick so that steam escapes. Brush entire surface with glaze mixture. Bake 350 for 20-25 minutes or until golden brown on the edges. I baked 14 only half way and froze them for future meals. 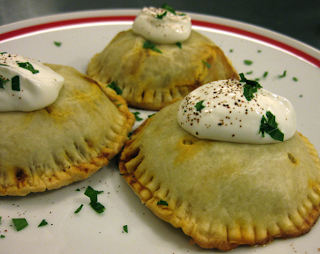 Top with sour cream, chili powder and chopped parsley. Salsa is also good, but I don't really think it needs it. John and I got this amazing little scrape tool in a house warming basket 2 years ago. We love it more than any other scraper we have ever had, as evidence by the wear and tear shown in this image. The way the tip curves is what makes it perfect for getting down into cans of sauce or scraping out the last bit of jam from the jar. We desperately WANT and NEED a new one but cannot find one anywhere. The person that gave it to us, purchased the house warming gift basket at a grade school fundraiser, so she ha no idea where to get another. We have been to every shop here on the island... well maybe not EVERY shop...and googled ourselves silly looking for a replacement. So we are now reaching out to our readers to see if they know where or how to find one, two or twelve. If anyone knows of where to get these, we will be forever grateful. 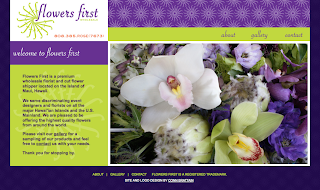 I am happy to announce that the brand new website for Flowers First Wholesale has launched. 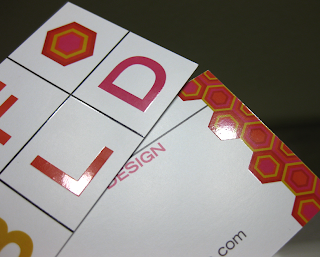 You might recall the business cards I had designed for them back in October. I loved working on and designing this site. Staring at flowers for a few weeks is not a bad gig. I also photographed all of the flowers, except for the anemone. Justin at Flowers First took that himself and is quite skilled behind the lens if you ask me. I love the simplicity of this new site and hope you enjoy it too. We'll be updating the gallery and flower list often so we hope you'll visit again and again. Or better yet... call and order something.